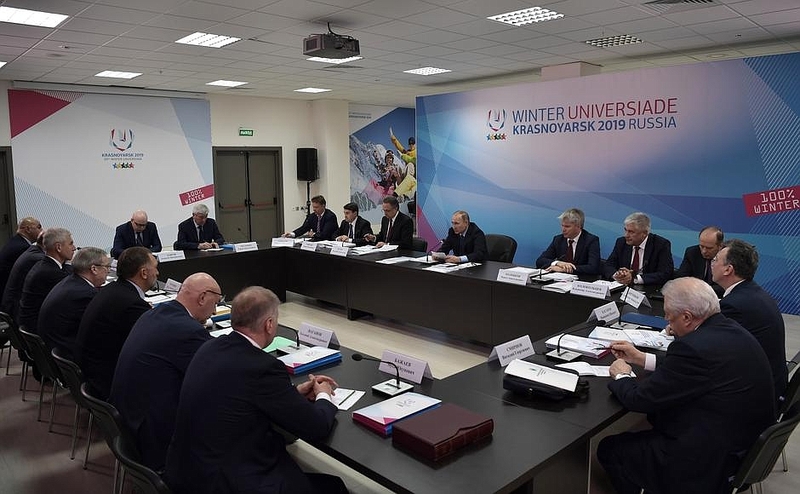 Preparations for Winter Universiade Krasnoyarsk 2019. 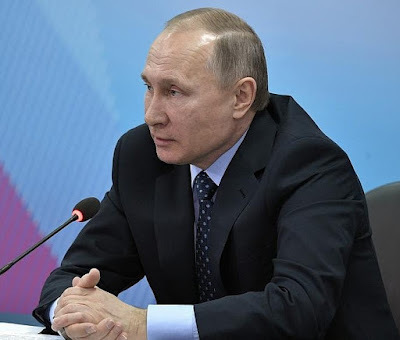 Putin.BLOG Sports Preparations for Winter Universiade Krasnoyarsk 2019. 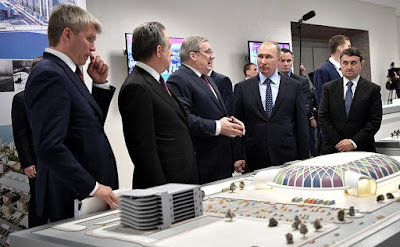 Before the meeting, the President was shown the layout of the facilities under construction for the 2017 Universiade, including mock-ups of a new airport complex, a sport training center, a sport arena and a downhill skiing center. President Putin also visited Biathlon Academy sport complex and met with the winners of the 28th Winter Universiade 2017 that took place in Almaty. Vladimir Putin at the meeting on preparations for the 29th Winter Universiade Krasnoyarsk 2019. Krasnoyarsk, the easternmost million-plus city in Russia and Siberia’s largest economic center, deserves to be given a new image and new development resources. It has proved its right to become a major sports center by successfully holding large international competitions. Today we had another look at the construction plans, and I really liked the layout. All the facilities will be located in a compact group within walking distance from each other near the city, in fact, just a few kilometers from the city center. It will be very easy for the people to use these sports facilities. And they will give a powerful boost to the development of Siberian Federal University. I have no doubt that this demand will help create a strong volunteer corps in time for the Universiade, the more so that the event organizers have at their disposal the faculty and students of Siberian Federal University, which will be the central base of the upcoming competition and will take over many sports and social facilities after the Universiade. Allocations equaled 8.9 billion rubles in 2014–2016 and 22.2 billion rubles in 2017–2019. 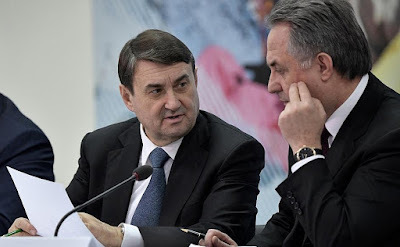 In all, the aggregate budget of the Universiade is 40.5 billion rubles and includes not only the construction and renovation of sports facilities but also a cultural program and the training of volunteers, as I said. This is a great deal, and so we expect a proportionate result from these investments. Let’s discuss all this in detail today. Of course, I have all this information in my files, but I would still like to hear your perspective. We need to go through all these issues and look at the situation with tenders and how these projects have been organized. We need to catch up and most importantly prevent projects from falling behind in the future. Another issue I wanted to raise has to do with clean sport. I am referring to the anti-doping programs. 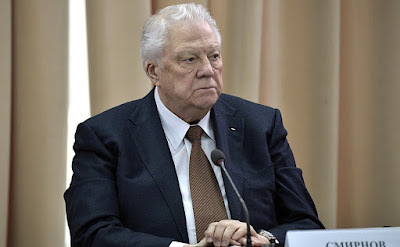 Mr. Vitaly Smirnov [Honorary Member of the International Olympic Committee, Head of the Independent Public Anti-Doping Commission] and I just had a conversation on this issue. I would like to thank him for the efforts undertaken by his commission in this area. As you know, we are putting into place a new anti-doping system. It will be transferred from the Sports Ministry and Government oversight to an independent organization, as many countries have done, and not in any figurative sense, but quite literally. 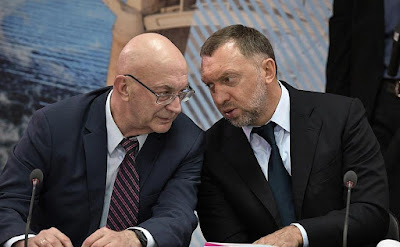 The laboratory will be located on premises belonging to Moscow State University, and we will help them to obtain the modern equipment, technology and specialists they need. 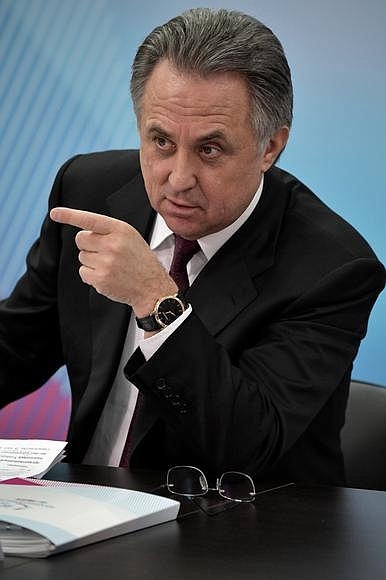 I hope that we will no longer have any swindlers, who organize doping programs themselves and then flee abroad. I hope that our independent specialists and foreign specialists will help us to develop a strict and effective anti-doping system. 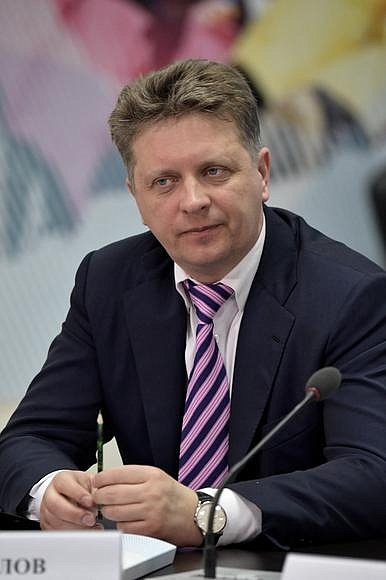 I hope too that Vitaly Smirnov’s commission as a public organization will continue its work to supervise the anti-doping organizations' work here in Russia. Of course, we must also work to ensure that doping does not arise in youth and student sport. These young people are just at the start of their sports careers. Let me say once more that we will do everything needed to organize positive, active and effective work with all our partners, including WADA and the International Olympic Committee. Presidential Aide Igor Levitin (left) and Deputy Prime Minister Vitaly Mutko before the start of a meeting on preparations for the 29th Winter Universiade Krasnoyarsk 2019. 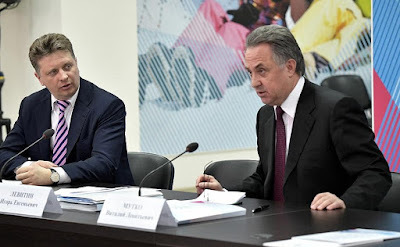 Transport Minister Maxim Sokolov (left) and Deputy Prime Minister Vitaly Mutko before the start of a meeting on preparations for the 29th Winter Universaide Krasnoyarsk 2019. 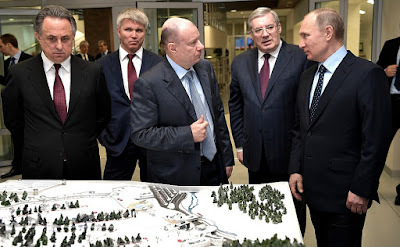 Before the start of a meeting on preparations for the 29th Winter Universaide Krasnoyarsk 2019. 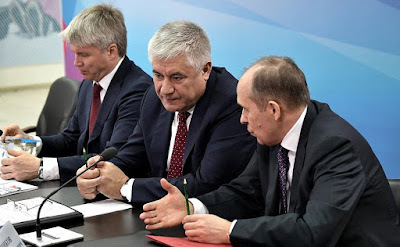 From left to right: Sports Minister Pavel Kolobkov, Interior Minister Vladimir Kolokoltsev, and Director of the Federal Security Service Alexander Bortnikov. 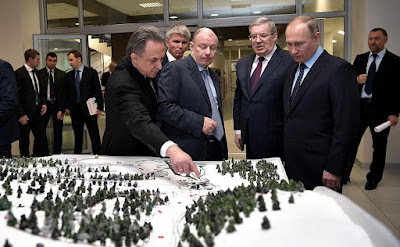 Russian President Vladimir Putin was shown a layout of the facilities under construction for the 29th Winter Universiade Krasnoyarsk 2019. Vladimir Putin in Krasnoyarsk. Preparations for the 29th Winter Universiade Krasnoyarsk 2019. President Putin watching a layout of the facilities under construction for the 29th Winter Universiade Krasnoyarsk 2019. Honorary President of the Russian Olympic Committee and Chairman of the Independent Public Anti-Doping Commission Vitaly Smirnov before the start of a meeting on preparations for the 29th Winter Universiade Krasnoyarsk 2019. 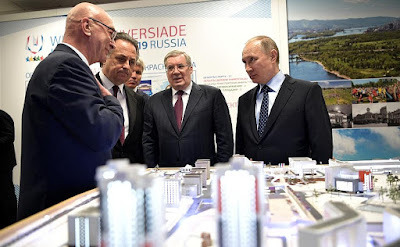 Ahead of the meeting on preparations for the 29th Winter Universiade Krasnoyarsk 2019 President Putin was shown a layout of the facilities under construction. Meeting on preparations for the 29th Winter Universiade Krasnoyarsk 2019. Rector of the Siberian Federal University (Krasnoyarsk) Yevgeny Vaganov (left) and Chairman of Base Element Group's Supervisory Board Oleg Deripaska before the start of a meeting on preparations for the 29th Winter Universiade 2019. Deputy Prime Minister Vitaly Mutko before the start of a meeting on preparations for the 29th Winter Universiade Krasnoyarsk 2019. 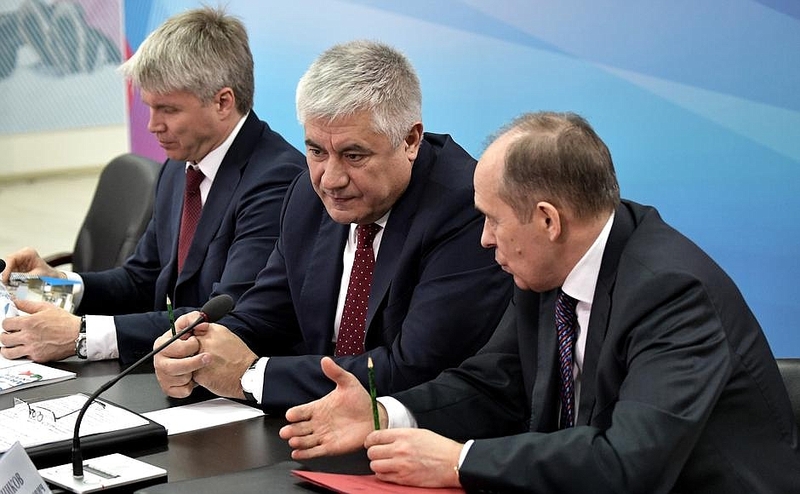 Transport Minister Maxim Sokolov before the start of a meeting on preparations for the 29th Winter Universiade Krasnoyarsk 2019. 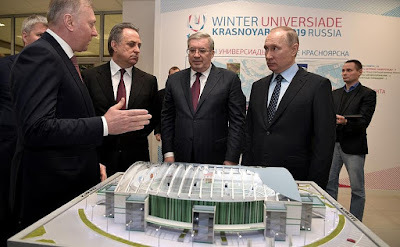 0 Comment to "Preparations for Winter Universiade Krasnoyarsk 2019."